May 2013 – Who Do You Choose: Cow or Chicken? Life offers you so many choices. How do you make your decision? Who would you choose to save, a cow or a chicken? The Red or Blue Pill? Mexican Quinoa Casserole, or Chocolate Chia Pudding … well you don’t always have to choose. Sometimes you can just have both! 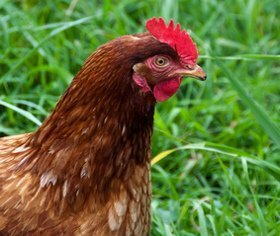 Give Up Red Meat Without Trading Animals’ Lives – Have you decided to give up ‘red meat’? If you are simply replacing it with chicken, fish, eggs or dairy, you could end up causing more suffering for animals than before. If you consider yourself to be a compassionate person, then please take a moment to see how you can make your food choices count for animals. Seeing for Two: If His Mother Could See Him Now – by Joanna Lucas at Peaceful Prairie Sanctuary. If his mother could see him now—her beloved boy, alive and well, and cherished, in a land of love and plenty. The Art of Mindful Living – Eating Together – by Thich Nhat Hanh. Eating a meal together is a meditative practice. We should try to offer our presence for every meal. The Health Benefits of Going Vegan – Following a healthy, balanced vegan diet ensures a host of health benefits for you, as well as the prevention of some of the major diseases striking people in western cultures today. 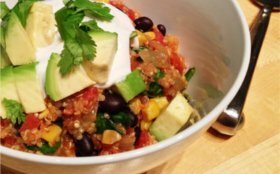 Oven-Baked Mexican Quinoa Casserole – This is a super easy vegan recipe from Angela to include quinoa into your diet with tantalising Mexican flavours. The quinoa cooks directly in the oven, so you don’t have to worry about boiling or prepping it first. Lentil Spaghetti Bolognese – This recipe from Mel is a perfect showcase for the delicious appeal of lentils. It is filling and great for kids and adults alike. Chocolate Chia Seed Pudding – You will love Adriana’s vegan chocolate pudding recipe. It is indulgent without being overly sweet, and is lovely and light. It is also a wonderful way to have your vital daily chia seeds. Homemade Vegan Sausages – Thanks to the Vegan Dad, these are easy to make and taste far better than anything you can buy ready-made from the supermarket. They are far healthier for your kids too! The texture is freakishly sausage-like, and you can braai them after they have been steamed. We’d like to say a big thank you to Phil and Heather, the wonderful people at UniWebServe, for sponsoring our web hosting for the past 6 years. Their friendly and efficient service is amazing and their patience is never-ending. 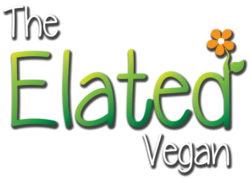 Thank you Heather and Phil for making it possible for Elated to spread the vegan message and save the lives of farm animals. You are quite literally life savers! Thank you also to all of you special Elated fans for your emails and your support. 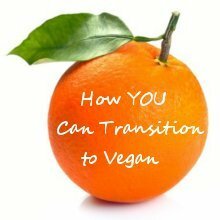 You are welcome to contact me if you need any information, advice or support on your vegan journey.